Christmas came early for cruise fans, and Carnival Cruise Line’s Brand Ambassador, John Heald, played Santa when he posted pics to his Facebook page of the upcoming Carnival Horizon. Want a sneak peek of one of 2018’s most highly anticipated ships? Take a look at these photos taken by Hotel Director Pierre Camilleri. If you’re familiar with Carnival Vista, Magic, or Breeze, the Pig and Anchor Smokehouse, you know exactly why this restaurant is so popular. The latest extension of Carnival’s partnership with celebrity chef Guy Fieri will, on Carnival Horizon, be located on deck 5. And while on other ships it has been an outdoor venue, here it has been moved inside… although there will be plenty of outdoor seating only steps away. Let’s face it, at some point, you’re going to be visiting the buffet. They could put a thousand different restaurants on the ship, and at some point we’d wind up wandering into the buffet “just to see what they have.” So why not take a look at where we’ll be doing our grazing? The area is shaping up nicely, with brand new chairs, tables, and railings. Carnival has had great success with the Bonsai Sushi restaurant, so it makes sense that with Horizon, they’ll take things to the next level by adding Teppanyaki, with chefs putting on a show while preparing some delicious food. Looking for a fun night for your family or friends? Gathering around the flat-top grill to watch these chefs do their thing is a guaranteed good time. The Fun Things slide is after named after those infamous troublemakers, Thing 1 and Thing 2! An enclosed body slide, this one will distinguish itself with a polka dot-motif and offer 213 feet of slippery fun. The two-floor main dining room, located on the back of the ship and stretching across decks 3 and 4, is starting to come together. There will also be a second, single-story dining room at the front of the ship on deck 3. Carnival will use one of the dining rooms for traditional dining, and the other for Your Time dining. On Carnival Vista, the check-in station for Your Time Dining is just to the right of the coffee bar, so there’s no reason to think it would be different here. Just like on sister ship Vista, Horizon will have the Pixels digital photo gallery on deck five. It will feature the facial recognition technology which automatically puts photographs into the portfolio of a passenger, thereby cutting down on the massive waste created by printing out hundreds if not thousands of photos, most of which will not be purchased. One thing to note is that similar to Vista, Horizon will have an aquarium-like view up to (or down from, depending on your perspective) deck 5. The glass partition keeps the smoke from going directly up to deck five, which is a good thing, given that there are several dining venues (including the steakhouse and Bonsai Sushi/Teppanyaki) are located there. 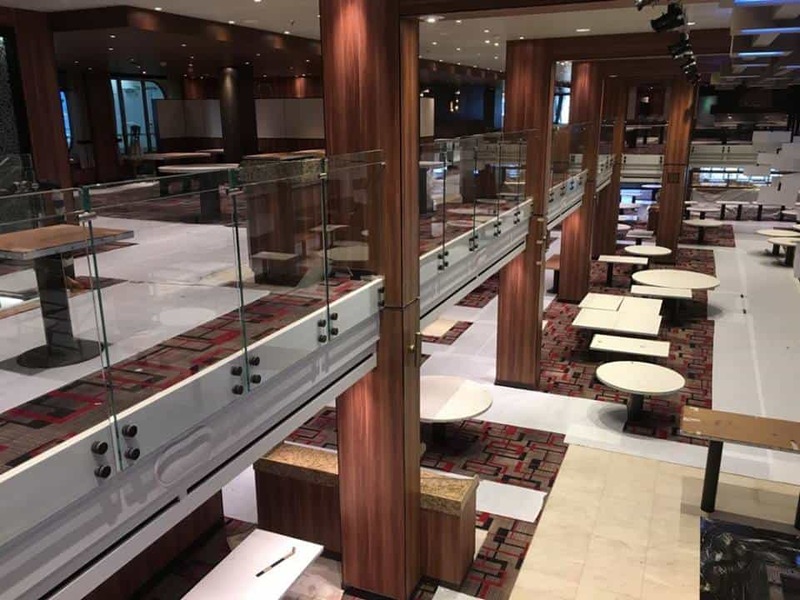 What do you think of these first images from the Carnival Horizon? Are you excited to sail on the line’s newest ship?